PEOPLE AGE 55 AND OVER For the work force 55 years and over, the LFPR is quite different from that of earlier ages. 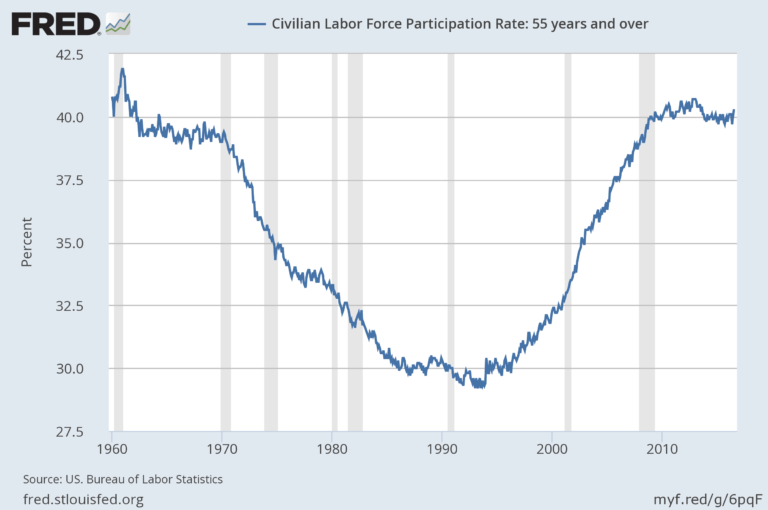 The LFPR of this group declined from about 43% in the early 1950’s to a minimum of about 29% in early 1990’s. Since then, it has been rising and continued to rise during the recession. It has been about 40% [5/16] for about two years. One explanation is this: “Perhaps older Americans are being forced to work more because they have not saved enough for their retirement. This lack of savings may be a result of the recent economic trends in America: stagnant wages, depleted retirement portfolios (from the 2008 financial crisis), and rising health care costs.” [http://bpr.berkeley.edu/2013/04/the-declining-labor-force-participation-rate-why-this-trend-should-be-taken-seriously/] The age at which workers are eligible for full Social Security benefits is rising and will affect the choices available especially to those 62 and over. With a later age for full retirement benefits, those retiring earlier will suffer a larger decline in monthly benefits.